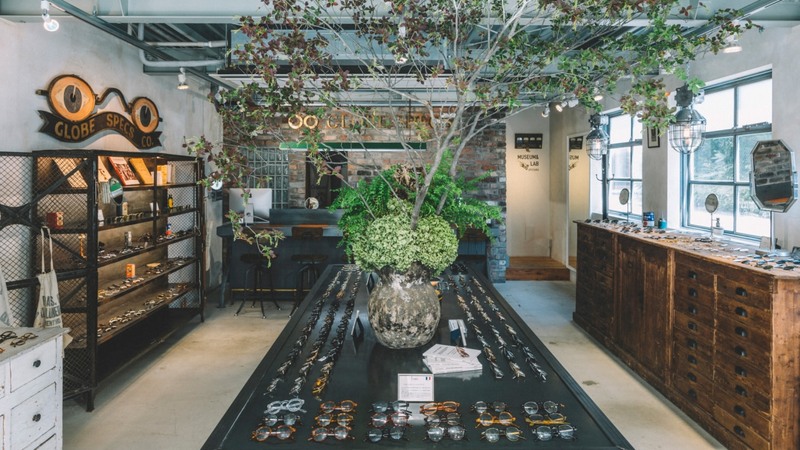 Established in 1998, the Globe Specs brand and its Shibuya flagship store in Tokyo, Japan, have become synonymous for creating eyewear for style connoisseurs. Founder Tetsuya Okada travels around the globe from Europe to the U.S. searching for the latest up-and-coming eyewear brands, seeking inspiration from the people, places, design and architecture of each place he visits. Globe Specs’ store concepts are an inevitable shrine to these worldly influences and artefacts, with antique shop furniture, old theatre seating and details such as original English ironworks electrical switches on display. skinflint’s original vintage lights are a natural fit. Our vintage lights are installed in both the Shibuya flagship store and in the new Daikanyama store, pictured. A set of three caged glass industrial pendant lights from the 1950s - salvaged from a former Polish factory - are suspended above a reclaimed wooden case, illuminating the display below. Elsewhere above the cashier desk, a vintage green enamelled fluorescent light by British manufacturer REVO - now converted by skinflint for modern LED technologies - is suspended, lighting the workspace below while also creating a statement focal point for customers wishing to proceed to purchase. “The lights are a perfect fit for our concept and also with all the other furnishing in our store,” says Tetsuya Okada.